Talk and Signing at Catholic University Washington D.C.
John Getchell pitches a glorious Portland doubleheader. Second game, signing at Books-A-Million, Portland. 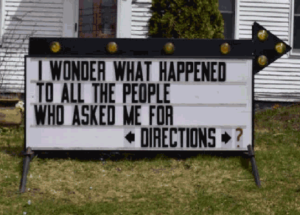 Ruminations and Wit from an American Roadside Prophet. Come on down to South Portland and grab a few last-minute stocking stuffers, signed by the writer hisself! He’ll say anything on your copy! 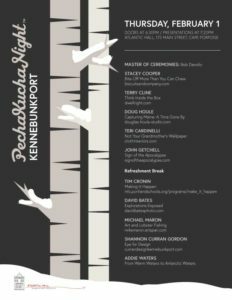 John Getchell will present Sing of the Apocalypse at PechaKucha Night Kennebunkport at Atlantic Hall, Cape Porpoise on February 1, 2018. Doors open at 6:30 p.m. / Presentations begin at 7:20 p.m. Okay, he' baaaa-ack. John Getchell's Talk and Book Signing at Graves Memorial Library will take place! Originally scheduled for December, the talk, the signing, and the author have been resurrected and will take their place of a Sunday, on Apri 8, 2018, at 2:00 p.m.
John Getchell is a writer, humorist, performance artist, neighbor and author. 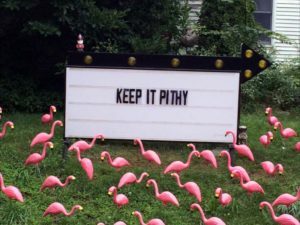 He conveys pithy tidbits of thought and wordplay every day right on his front lawn on his "internally illuminated portable marquee." John will share the story behind his sign with visuals, stories, and audience engagement. 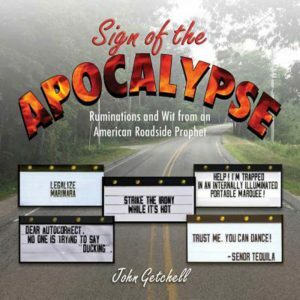 The ever-engaging and thoroughly charming John Getchell will be on hand at Sherman's during the Old Port Festival give a talk and reading about his book, "Sign of the Apocalypse: Ruminations and Wit from an American Roadside Prophet." 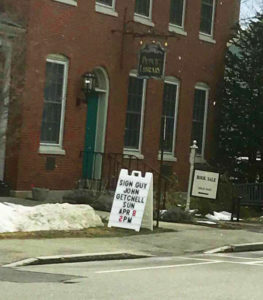 A proven hit with seniors and youngsters and all in-between, the ever-engaging local folk hero and thoroughly charming John Getchell will be giving a talk book signing Atria Kennebunk, talking the talk and signing copies of "The Sign of the Apocalypse" from 3:00pm - 5:00pm. 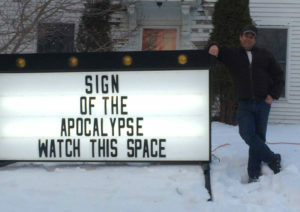 Join Master of Ceremonies John Getchell with Sign of the Apocalypse and the PechKucha gang at Atlantic Hall on Main Street in Kennebunkport on August 23, 2018. A good time will be had by all! Covfefe 4vr! John Getchell’s Talk and Book Signing at McArthur Public Library will take place on October 25, 2018, at 6:30pm. Arundel’s resident humorist John Getchell will bring on the laughs as he reads from his book, Sign of the Apocalypse. Book Talk, Signing, Sale McArthur Library in Biddeford He's baaaa-ack! John Getchell's Calendar and Book Sale and Signing Spectacular will take place in Biddeford at McArthur Library on December 13. Stop in and pick up two perfect stocking stuffers for the funny people in your life - The Sign of the Apocalypse Desk Calendar - and of course the book that started it all!